First-term Michigan Congresswoman Rashida Tlaib has already shoved her stake into Capitol Hill’s virtual ground declaring her intention to lead her own congressional delegation to Israel’s disputed territories in biblical Judea and Samaria, otherwise called the West Bank. Like actress Bette Davis famously said in her 1950 movie ALL ABOUT EVE, “Fasten your seat belts. It’s going to be a bumpy night.” My line; Fasten your seatbelts, Congress. It’s going to be a bumpy two years. Rep. Tlaib and I diverge on our Israel perspective; although I am impressed with her drive as the daughter of Palestinian immigrants. She learned English, earned a law degree, and served for six years in Michigan’s legislature where she advocated for low income citizens. 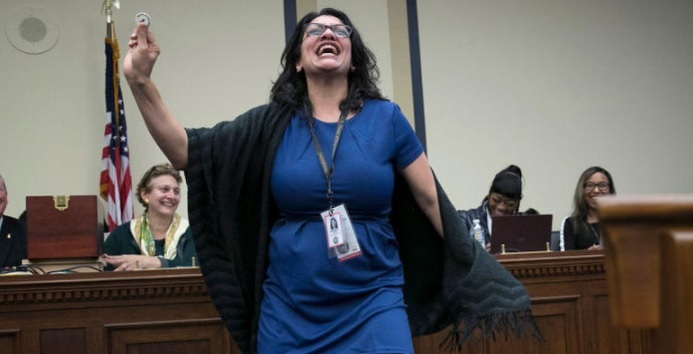 On her Tweet profile, Ms. Tlaib describes herself saying, “Unbossed Congresswoman for Michigan’s #13districtstrong, Mama working for justice, social worker at heart, Detroiter, Palestinian American, proud Muslima.” I guess the word “Unbossed” is a signal to members of congress-and beyond-including her House boss Nancy Pelosi. Time will tell.